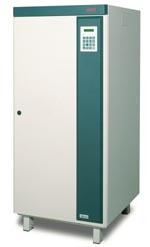 Standby or offline UPS offer a low price solution for sites with normally good power. Think of a standby as "insurance" rather than a power treatment device. During normal operation, the standby simply passes power from your wall outlet directly through to your equipment. When voltage or frequency problems occur, the standby switches to battery power (the battery's DC power is converted to AC power by an inverter) to provide safe power to your equipment. A line-interactive UPS provides enhanced power protection at mid-range prices. Think of this design as a "standby UPS with voltage correction". This design offers simple voltage correction "bumping" voltage up or down by a pre-set amount before passing it through to your equipment. Features and performance among models and brands vary most widely under this category. All offer self-test with "Replace Battery" warnings. The line-interactive UPS is a good choice for the application where you have more brownouts than blackouts, and your load isn't mission critical. The online UPS systems offer the highest level of power protection available and have the most expensive design of the three. 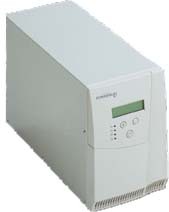 This UPS converts all AC input to DC power, then generates new AC power for your equipment. The online UPS offers precise voltage and frequency regulation, and of the three types of single phase UPS systems, the online UPS offers the highest level of power filtering. This UPS also has a fail-safe bypass and can switch to utility power if the UPS has an internal failure. The online UPS should be used at sites with chronically poor power or extremely critical loads. We offer 3 phase UPS systems from APC, Powerware, General Electric and Mitsubishi to meet the most demanding, most critical applications. Small and large data centers, industrial and production applications, and telecom systems are typical UPS projects. We can configure single-unit systems or parallel/redundant systems to meet most any requirement or budget. Please contact us for assistance in determining the need, type or size of UPS to protect your critical systems.